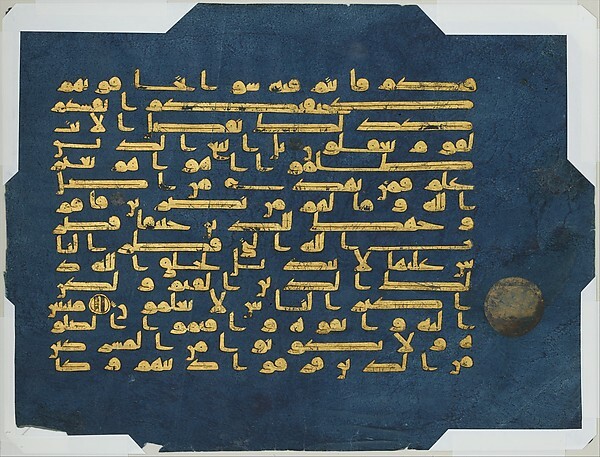 This is a non-illustrated manuscript from a “Blue Qur’an” from the ninth or tenth century. This version of the Qur’an is made entirely on indigo pages with gold and silver script, both of which indicate its origin in North Africa. This folio is without the necessary marks to determine when words begin and end and, thus, is extremely hard to read. It is most likely a decorative copy. 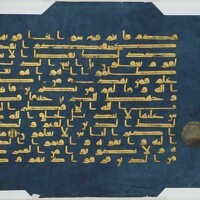 “Folium from the "Blue Qur'an" (second half 9th to mid-10th century) from the Metropolitan Museum of Art,” Medieval Hollywood, accessed April 24, 2019, http://medievalhollywood.ace.fordham.edu/items/show/95.